The more things change, the more they stay the same. My paper journals are full of entries that start "I know I said I'd write here more often..." Well, enter technology to give me more things that I don't address. Do you ever find that you ignore the things you actually care about for loads of things you have to do? Well, I didn't intend to wax philosophically; I intended to talk about food. I recently discovered this dish, which is kind of one of those things you'd expect to see on the back of a Pillsbury box, but it's comforting and filling and fun. 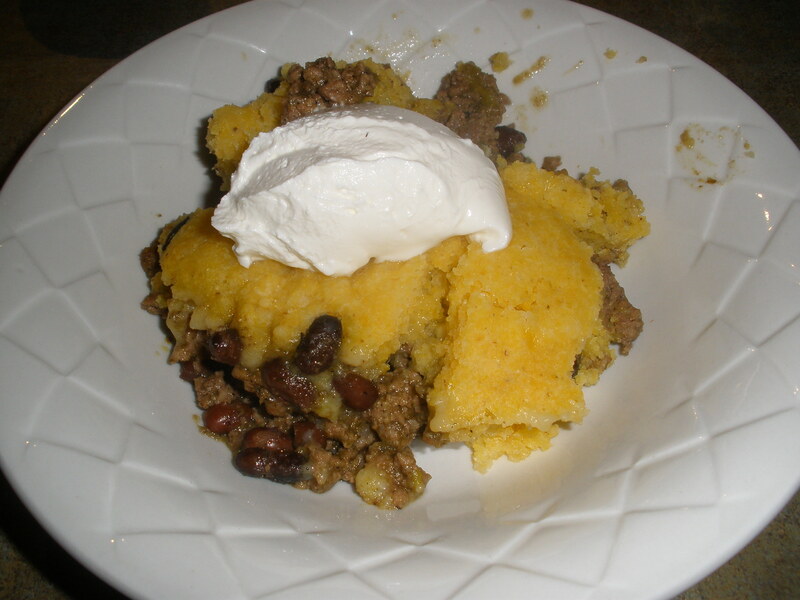 It's Tamale Pie. The first time I made Tamale Pie was in the oven, from a recipe I found in the wonderful cookbook, The Best Casserole Cookbook Ever. But, then I bought a Crock Pot, and was possessed with finding a way to make everything in it. As it turns out, this recipe showed me how (results in the photo above--yummy looking, yes?). I made a few minor changes in my interpretation of the recipe. I skipped the garlic powder because I wasn't sure how garlicky the Frontera Green Chile enchilada sauce would be. I didn't miss it. I also threw in some fresh corn, used Mexican shredded cheese instead of plain cheddar, and used black beans instead of kidney beans. I also shortened the cooking time to 2 hours on high instead of 5.5 on low. Cooking in the Crock Pot doesn't make this recipe particularly easier, since you still have to brown the beef, but it's great in the summertime when you would like to keep the kitchen as cool as possible. I have also made this with canned diced tomatoes in the meat mixture. I've also made it without enchilada sauce, putting in taco seasonings instead. Or, how about some diced bell peppers? Or diced chiles either in the meat or in the cornbread? Or turkey instead of beef? Do whatever you want! The point is a savory meat filling with a nice cornbread crust! You dig? The cornbread mix I used was corn muffins from Jiffy. It was a bit sweet and cakey, understandably, so I would probably find the one I used last time (which, conveniently, I can't actually remember the name of or where I bought it...). Whatever. It was still delicious, and I didn't have to heat up my house and make my a/c work any harder than it had to on this 95 degree day.